These cookies are rich with flavor and crunch from the macadamia nuts. You can make them in various shapes - circles, triangles or rectangles - up to you! Always a crowd pleaser and terrific to bring a batch to your kids school, work or the local fundraising event. Use an electric mixture, beat butter until light and fluffy. Gradually add the ¾ cup powdered sugar until combined. Add the vanilla extract and salt. Add the flour gradually until all combined. Add the macadamia nuts and mix until incorporated. Chill dough for about 20 minutes. Preheat the oven to 325. Divide dough into 3 balls. Work with one ball at a time. Flatten into a disk that is about ½ inch thick. With a knife, slice one inch wide strips. Each strip is then cut into one inch squares. Repeat the above process until all the dough is used. Place onto cookie sheets. Brush each cookie with a pastry brush the egg white mixture. 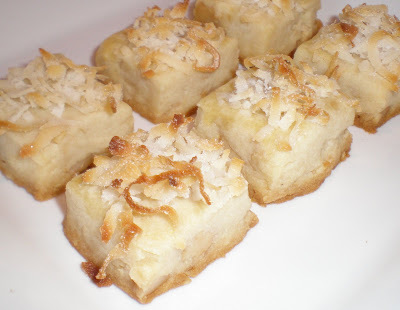 Place a small pinch of the sweetened coconut on top of each cookie. Bake for about 18 minutes. Remove and place onto wire racks to cool. Transfer to an airtight container to store.